It being the annual Heritage Open Days last weekend, I took the chance to see a local curiosity that I have known about for years but never visited. The Twitch Inn is a basement – two and a bit small rooms – under Douces Manor, an 18th-century grandees' residence (though not actually the manor) in West Malling, Kent, which for a few years during the Second World War served as HQ and officers' mess for the RAF base about a mile down the road. 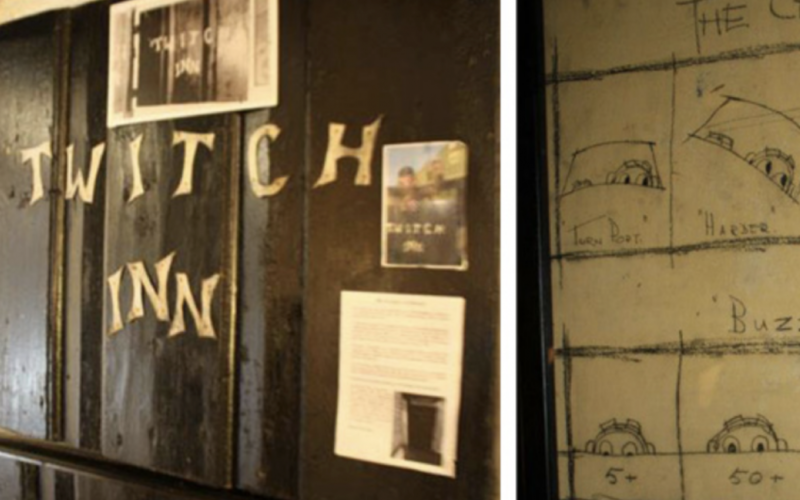 The Twitch itself derives its name from the traumatic nature of the day job (and sometimes night job) and is a minor trove of memorabilia, graffiti and cartoons by those stationed in the area, attempting to kill time while not out killing Jerry. Its most unusual feature is the many airmen's names inscribed on the ceiling with soot from candles held between their toes – though whether thanks to nicknames, drink or nerves, no famous air-ace monikers have yet been recognised. Among those who most definitely crossed the threshold, though, are Group Captains John 'Cats Eyes' Cunningham (a night-fighter pilot) and one-time station commander Peter Townsend (familiar to a whole new generation now, from his portrayal in The Crown) and Wing Commander Guy Gibson (later of the 'Dambusters'). It was his 29 Squadron that 'officially' christened the Twitch, using metal lettering suspected to have come from the bodywork of a plane to name the top half of the bar-room's stable door. For it, and to it, some might chuckle. On his last night stationed at West Malling, Gibson led a squadron pub-crawl from Maidstone, five miles away, back to the airfield pub, The Startled Saint, where his (in)famous dog had already been barred for drinking to excess one night and spoiling the landlady's carpet. On another occasion, the Rose and Crown saw celebratory gunfire – inside – when the Air Ministry overnight promoted air crews to the rank of sergeant. Initially used in the First World War as a landing ground for foggy bases on the North Downs, the West Malling airfield was reclaimed at the start of the Second World War as a satellite of Kenley and a forward landing ground for Biggin Hill. The first operational unit to arrive there was 26 (Army Co-Operation) Squadron, fresh from dropping food and water to the evacuees at Dunkirk. Though the airfield was not fully operational in time to play a major role in the Battle of Britain, the Luftwaffe considered it a sufficient threat to warrant bombing repeatedly that summer – and in the next few years it became home to dozens of squadrons, mostly fighters, and to pilots and crews from, among other places, South Africa, Canada, Australia and Holland. RAF West Malling officially opened on 14th April 1941, its badge incorporating the Norman tower of St Leonard's chapel, which still stands a couple of hundred metres from the Manor – a relic of defensive measures in this part of the country over the better part of a millennium. From it flew an entire catalogue of planes, escorting bombers, patrolling the Channel, destroying enemy trains, supporting the Dieppe raid, spotting gaps in the blackout system, and, eventually, bombing Germany. Its greatest claim, though, must be as the place where Australian Flying Officer Ken Collier discovered a bold new method of destroying V1 rockets... by flying alongside them and tipping them over with his wing! West Malling soon became the base for this activity. But after the war there was decreasing use for it. As for the Twitch, in the late 1960s it found a brief new lease of life as the nightclub of a French restaurant – rather flexibly referred to as a 'former Battle of Britain cellar bar' – offering 'discotheque and buffet'. It was apparently quite well attended, by the town's drinkers and their publicans alike, after the pubs closed. Restored in 2009, in conjunction with the divvying up of Douces Manor into private residences, it is now curated and staffed by the Malling Society. Beyond the RAF exhibits, there are corners dedicated to the local paper mills, 20 or so village boozers, the fire service, the workhouse (which George Orwell visited), the police station and magistrates' court, the Douce family silver, the Women's Royal Voluntary Service, and 'local characters' of all shapes and sizes. It is open up to 20 times a year, and the day I went it was enthusiastically attended by aviation geeks, mums reading info-boards to kids, and old-timers recalling wistfully the town they once grew up in. But then the conversation turned to what a shame it was that no one measures things in poles and perches now, and I decided it was time to go to Tesco.